Spray Tack Carpet Adhesive is a high solid content, single component, solvented, moisture curing, sprayable polyurethane adhesive. 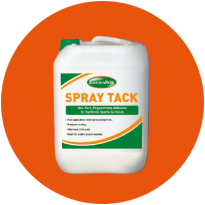 It is suitable for bonding synthetic sports surfaces to a variety of substrates and possesses a high initial tack which allows positioning and good ‘grab’ of the carpet to the sub surface. • High initial tack for fast ‘grab’ of carpet. • Spray technique ensures fast application. • High coverage rates by ‘splatter spray’ method. • Strong, flexible, weatherproof final bond. • Particularly suitable for needle punch carpet installation.